Have you ever wondered where all of the artifacts and records that aren’t on display at a museum are kept? This week I got to take a tour of the hidden collections at Banting House. Tucked away where they can be protected, there are an assortment of photos, paintings, and other objects (like the original doors for the house) that make up a large amount of the Banting House collection. Unfortunately there just isn’t enough space in the galleries to show everything, so there has to be a system to keep track of where everything is at any given time. While I’d thought about how tough it must be to manage a collection, I’d never really considered how tools like a software program could help not only to tell you what items you have, but also where they are kept and why they are significant. This is where the PastPerfect program comes in for Banting House. I was looking through the database a couple of days ago to try to get a grasp of what the system does. First of all, it helps to organize the collection so if you were looking for a certain item, such as a particular painting, it would be a lot easier to find than combing through the shelves to find it. Now, that being said, Grant seems to know exactly where everything is as he showed me some of the paintings by Banting and part of a tea set that had been donated by Judge Sheneshen. That must come with practice! The system also helps to identify who donated specific objects or why an object is significant to the collection. It seems there’s always more than meets the eye when it comes to museum collections! Investigating the database and collection, it really hit home just how much work goes into caring for a collection and how many things you have to think about to make sure that it’s protected. For instance, how much space you have to display objects and store them has an impact on how much you can have in your collection. You also have to determine what shape records or objects are in to understand what sort of care is needed to properly maintain them. It’s not as easy as finding a place on a shelf and cataloging that an object is there. The items that are put on display definitely have interesting qualities, as well. Some of the newest additions to the Novo Nordisk Canada Gallery are a collection of insulin vials that date back to 1922. These would have been among the first batches created and distributed for use, which is something you don’t see every day. When you look closely at some of the vials, you can actually see that some sediment has formed at the bottom over time – probably a good reason to watch the expiration dates on medication! It also shows us that the refinement process in the 1920’s maybe wasn’t as effective as it is today. 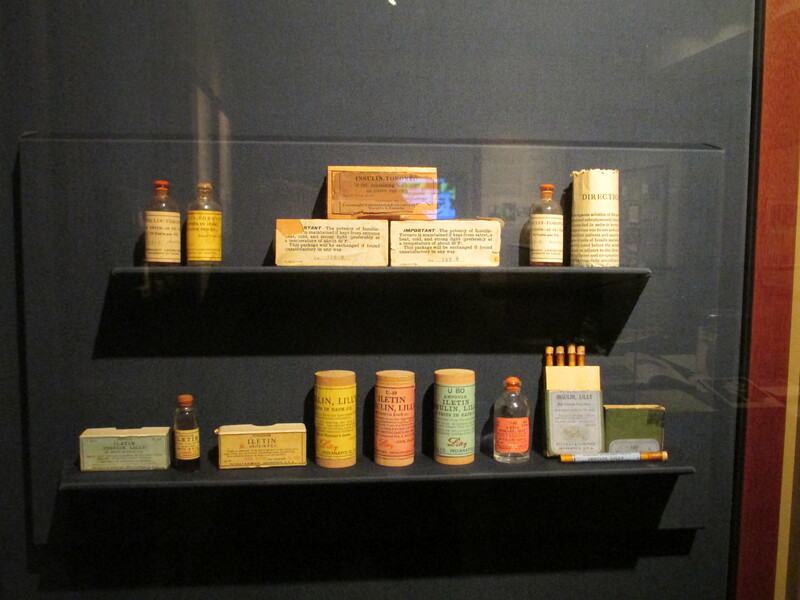 These are some of the insulin vials now on display at Banting House. Even the smallest objects and records can have amazing stories and value behind them. I’m glad I got the chance to look a little deeper into the Banting House collection and to understand more about the inner-workings of taking care of the objects that make a museum come to life. Previous Post Week 2 at Banting House: Tours and Event Planning!